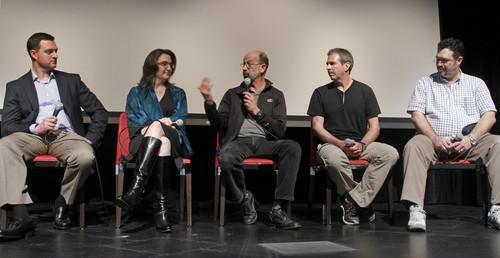 A panel including Facebook's Bill Weihl, center, and Google's Gary Demasi, far left, at a Greenpeace event Wednesday. Facebook, Google, Apple and some other tech firms have been investing heavily in renewable energy sources such as wind, hydro and solar. While cautioning that they have more work to do, Greenpeace said the companies are showing how big organizations can use their buying power to reduce dependence on fossil fuels. "The changes I'm seeing from the companies in the room here are giving me big hope," said Gary Cook, a senior IT policy analyst at Greenpeace, at an event in San Francisco attended by Facebook, Google, Rackspace, Yahoo and other companies that have made commitments to renewable energy. It's a big change from two years ago, when Greenpeace was running its "Tell Facebook to Unfriend Coal" campaign. At the time, it slammed the social network for building two giant data centers in Prineville, Oregon, where the main source of power is coal-fired plants. What's encouraging, according to Cook, is that Facebook's move in Iowa encouraged the local utility, MidAmerican Energy, to increase its own investment in renewables. "It shows the ability of a big company like Facebook to leverage their buying power to drive change," he said. The paperwork to introduce the tariff isn't complete yet but Google is hopeful it will be filed soon, said Gary Demasi, who's in charge of Google's data center location strategy. Greenpeace isn't suddenly heralding online firms as saviors of the environment. "You have a big part of the sector that's still focused on growing as fast as they can, and not necessarily looking at how they are growing," Cook said in an interview. Nor are all cloud providers on board. Amazon Web Services is one of the world's biggest cloud providers, but "you'd be hard-pressed as a customer to get any information about how much energy they're using or what type of energy they're using," Cook said. And Amazon provides the computing infrastructure for a lot of other online brands, he noted. Energy regulations make it harder to consume renewables than it should be, and there's not yet a "cookie cutter" approach that can be applied from one project to the next, said Bill Weihl, who runs Facebook's sustainability efforts and previously had the same job at Google. But utilities are becoming more open to partnerships with data center operators, he said. It helps when you're as big as Facebook and Google, who can apply pressure in return for the promise of their business. "If we're going to bring you millions of dollars in revenue, we really think we should get the product we want," Google's Demasi said. The imperative to make cloud services greener is great. Almost half the world's population will be connected to the Internet by 2017, according to research from Cisco. And if the cloud computing industry were a country, it would already be the sixth-largest consumer of electricity, just behind Russia, Cook said. "The story's not yet been written; it's being written now," he said.